Major General William H. Graham, Jr., Deputy Commanding General of U.S. Army I Corps, to speak at our May 14 Banquet. Don’t miss this Pittsburgh native, Pitt Alumni, and former USACE Pittsburgh District Commander! 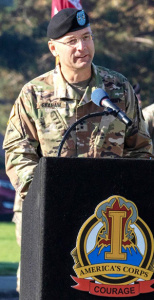 MG Graham currently serves as Deputy Commanding General of I Corps and Joint Base Lewis-McChord. He and his wife Janet have been there since August 2018. His prior assignments include: Commanding General and District Engineer of the USACE North Atlantic Division; Chief of Staff for USACE in Washington, D.C; Engineer Director for the NATO Training Mission in Afghanistan; Commander of the USACE Pittsburgh District; Division Engineer for the 1st Armored Division and Multi-National Division-North during Operation Iraqi Freedom. His combination of engineering, warfighting, and leadership make him an ideal speaker that you won’t want to miss!